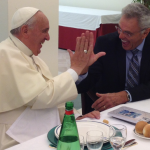 ROME – Two controversial TV preachers recently met Pope Francis in an effort to work toward tearing down the ‘walls of division’ between Catholics and Protestants. Copeland heads Kenneth Copeland Ministries and Eagle Mountain International Church, while Robison is an “apostolic elder” at Gateway Church and co-hosts the Life Today TV program. In 2008, CBS News released a detailed report on Kenneth Copeland Ministries, saying an investigation “raises serious questions about the Copeland’s religious empire.” For example, according to the report, the “ministry” operates private jets which are often used for vacation trips. “God knows where the money is, and he knows how to get the money to you,” Copeland’s wife, Gloria, once preached, according to The New York Times. Like the Copelands, Robison has been criticized for straying from traditional biblical teaching. He once invited “Father” Jonathan Morris to his Life Today TV program and praised his Catholic beliefs and practices. “As a Protestant, every time you talk—every time I see you, I see Jesus,” Robison told Morris, according to Ken Silva at Apprising.org. “I wish most Protestant preachers had the sensitivity, and discernment, and gift to communicate that you have,” Robison added. “On [June 24], for nearly three hours, a few of us were blessed to meet in an intimate circle of prayerful discussion,” Robison wrote in a blog post. Several other evangelicals, including Robison’s wife, were present at the meeting, which was organized by an Episcopal bishop. Robison said he enjoyed every moment with the leader of the Roman Catholic church, saying he even gave Pope Francis a friendly high-five. Copeland shared similarly positive sentiments about the visit. According to Robison’s blog post, Copeland “lovingly” spoke “a few words of encouragement” to Pope Francis, afterward praying for him. 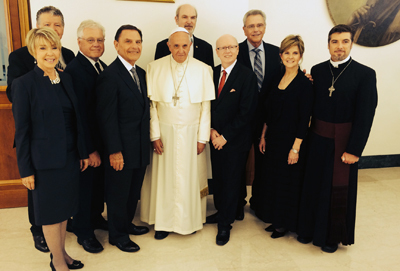 When news of the ecumenical get-together at the Vatican was publicized, many Christians expressed disappointment, saying it was unwise for the evangelical leaders to meet with Pope Francis. “We should bear in mind [that] Catholic doctrine can never marry with the doctrine of Jesus Christ,” another argued. “There is a huge difference between loving and helping your neighbor and adopting their heresies,” a third asserted.